We have had a busy November! Over the past couple of years, we’ve been using VerticalResponse for our emailed newsletters and updates. Unfortunately, a lot of our community members are not getting our emails which has been a concern for our Secretariat. Thanks to our Communications Chair, John Vu, we will be trying out Mailchimp to see if it is more effective at getting our emails to everyone in the Movement. You can help us tremendously by adding the email address “comm.sjcursillo@gmail.com” to your safe sender list to inform your email system that we are viable organization. Moreover, if you know of any community members who were not getting our emails or would like to be part of our Facebook group, please have them contact John Vu. Earlier this month, the Cursillo Community gathered at the Rector and Rectora Discernment for the Spring 2019 Cursillo Weekends and the Holy Spirit has chose Marty Dale and Lyn O’Connell. Our congratulations goes out to them and my thanks to all those discerned. If you want to be considered for their teams, now is the time to contact Lyn and Marty. 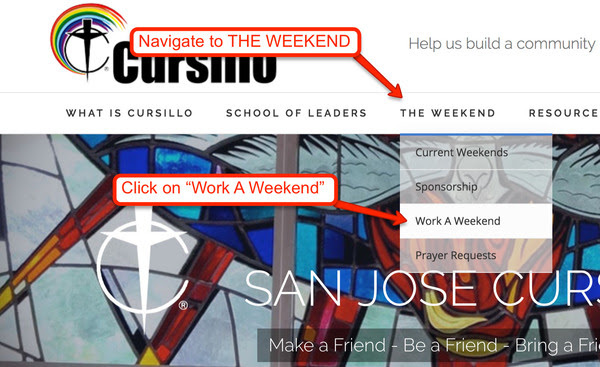 You can express your desire to serve by putting in a work application on the San Jose Cursillo Website by navigating to www.sanjosecursillo.org, hover over “THE WEEKEND” and click on “Work a Weekend”. I am pleased to announce that Mickey Salem and Sandy Tinapay were chosen as the new Three Day Co-Chairs on the Secretariat. Not only are we blessed to have them take on this very important role but I know they will contribute to both the upcoming weekends and the work of the Secretariat. I want to also express my gratitude to Brian Donnelly who filled in as the Three Day Chair for the Fall 2018 weekends. His tireless efforts have greatly helped both weekends to succeed! We all know about the devastation caused by the camp fires in Northern California and many in our Cursillo Community have family or friends who are impacted by this terrible disaster. One way we can help out the victims is to attend a fundraiser being held at Santa Teresa Church on Sunday, December 9, 2018 from 5:00PM to 9:00PM. The event will feature a homemade Italian dinner, raffle, music, drinks, and desserts. All who come will be asked, in lieu of buying a ticket, to make monetary or gift card donations. We will also appreciate donations for the raffle and silent auction including anything of value such as restaurants, services or other gift cards that can be offered for this great cause. Anita Bickham and Amy Blalock Castillo are organizing the event so please let me know if you like to make a donation or dropping off items. On behalf of the Secretariat, I want to wish you along with your family and friends A Happy Thanksgiving and a Blessed Advent as we prepare to celebrate the Coming of our Lord Jesus at Christmas. Join your fellow Cursillistas for an evening of good food (potluck), great friends, sharing, encouraging music, and fellowship. The evening will begin with social time from 6:45pm – 7pm, followed by prayer, meditation, sharing in small groups, witness speakers, and a keynote speaker. We will end the evening with offering our individual petitions as prayer and a rousing version of ‘De Colores’. The Fall 2018 Women’s Team will be hosting. Join your fellow Cursillistas for an evening to gather and strengthen our faith journey. The evening will begin with social time from 6:45pm-7pm, followed by a talk by one of our priests, deacons, or religious, and then followed by a talk on a technical aspect of Cursillo. We will end the evening with offering our prayer and ‘De Colores’.